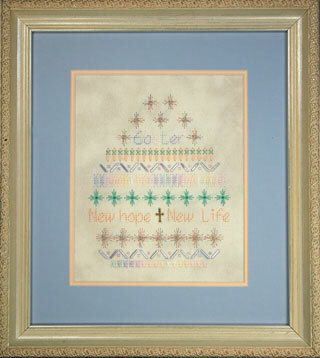 The second in the Holiday Highlights series, Easter reminds us of “New hope, New life”, all with cross-shaped stitches surrounding an antique gold cross charm. The design is worked with Crescent Colours and DMC flosses, with a bit of Kreinik #4 Braid and Mill Hill glass seed beads and bugle beads, on 28 ct. hand- dyed Queen Anne’s Lace Jobelan. 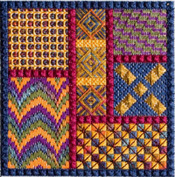 Finished size about 5" x 5 ¾"